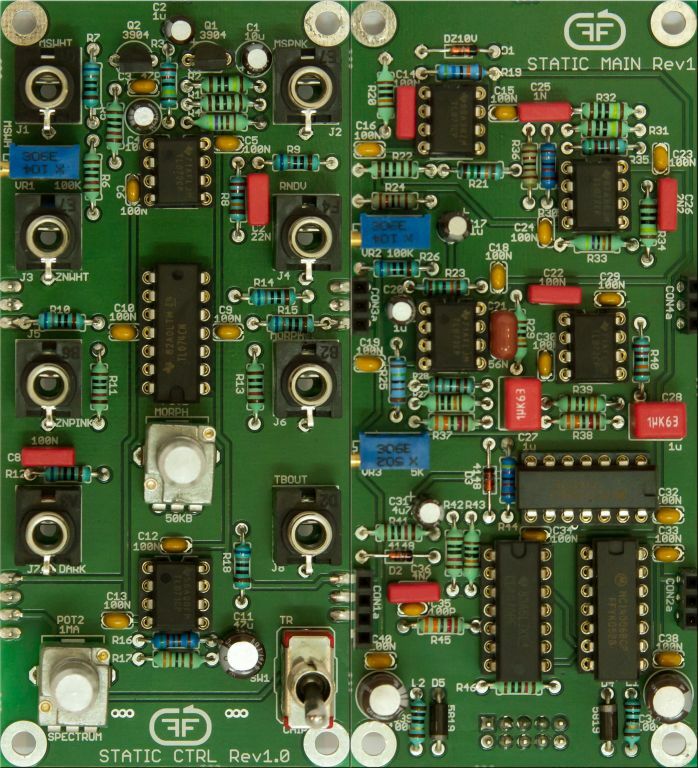 Like every module we developed in the past this new noise module was born out of our own necessities. We needed some versatile noise sources in our own systems so decided to study the most interesting and useful designs from the past. implementations that follow exactly the theory is not an easy or cheap thing. of the white and pink noise signals. Knowing this, we decided to make a module with different methods of generation and also different sources of basic noise. 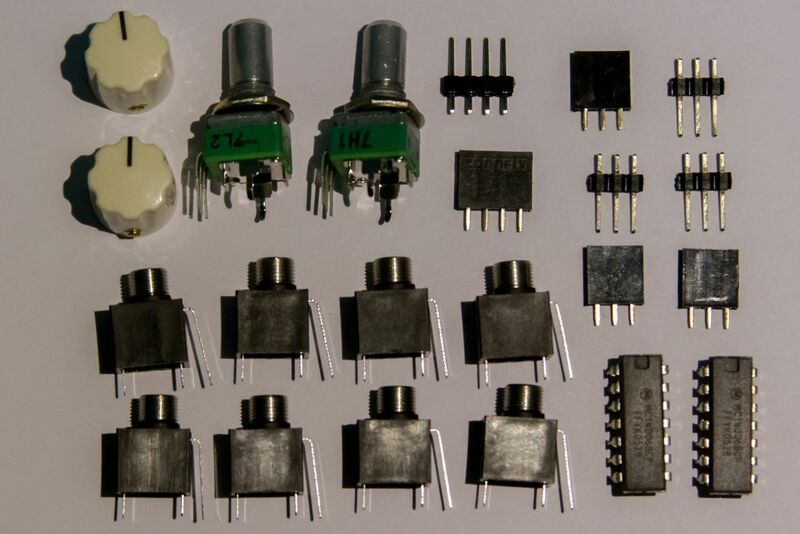 The MS noise is a white and pink noise generator based on transistor noise. The ZN noise is a more complex circuit based on zenner diode noise with some interesting features. While developing the project on breadboard we decided to add some interesting and useful features. to a decimated/digitized chip tune like noise. Also Chris suggested to add to the ZN noise a morph potentiometer and an additional out for a variable noise from pink to dark noise. The random CV out is also an added useful bonus . with many independent outputs and a few interesting add ons. 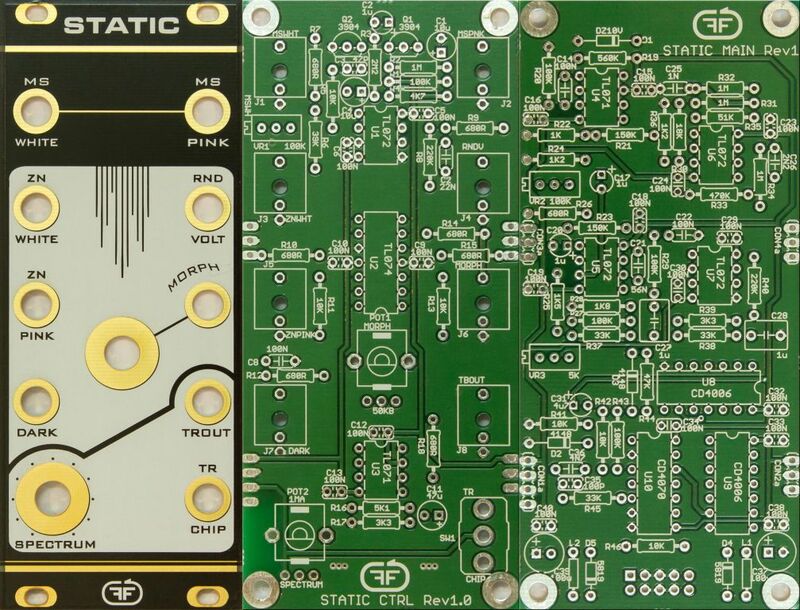 We are very pleased with this module and we hope it will satisfy not only our needs but also the needs of most eurorack enthusiasts. The project is not very complex but it needs two out of production shift registers: CD4006 (or MC14006). Noise through VCA with ADSR in the same order than previous recording. Complete module will be 70EUR. I uploaded some audio demos for the module. This looks awesome! (As do all of your modules, of course). I love that you've built in fundamentally different sources of noise generation. My stock of 4006 is very low, so I'll go in for a kit 2. I was getting ready to buy some stuff on your site, but I'll buy this first. By the way, I think this is the first module with a "trout" jack. Found some 4006s, so I'll do a kit 1 instead. This looks great! I'm definitely in for Kit 2.
well done Andrei on a fantastic cornucopia of noise.I say this as the proud owner of two preproduction modules.one calibrated for +/- 12 eurorack and the other at +/-15 for use in my Buchla system. The spectrum and morph controls are the clincher.iIve found them really useful in S/H patches where I would have previously used a filter.top product,top seller,top support.and thanks again for the fast leadtime on two builds. You folks are doing some great work! All the new kits and modules are now available. Check it out! I have some CD4006 in the bin; I'm in! Will you be restocking these kits anytime soon? I was looking forward to one of them.